View of the Glass Corridor from the Courtyard. 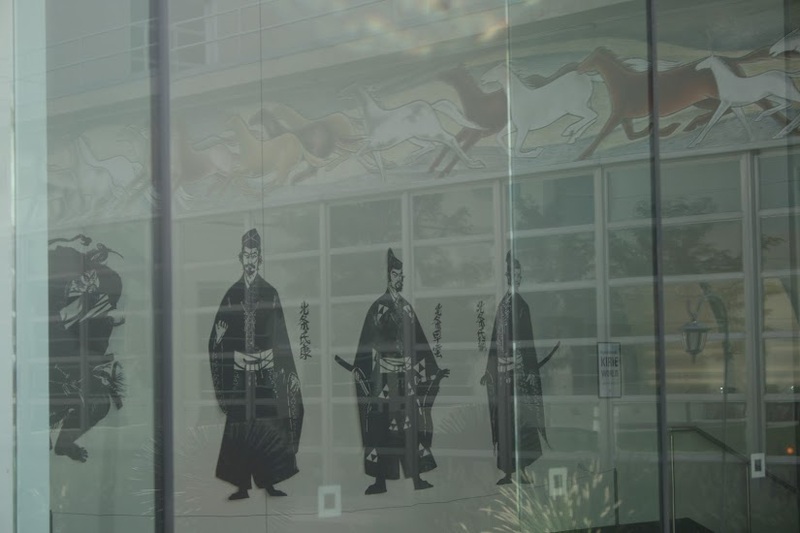 Hyakkimaru's Kirie World is on view in the Glass Corridor and the Hybl Screening Room. The window reflection shows Frank Mechau's outdoor mural, Wild Horses. The closing of Wild Horses over the weekend after Friday's Whiskey for My Men, Beer for My Horses has made way for a new mini-exhibition, a retrospective of Colorado Springs architect John James Wallace. Wallace's works are one part of the AIA's celebration. Hosted in conjunction with American Institute of Architects - Colorado, a collection of large-scale photos will be on display showing Wallace's works around the Pikes Peak region. His portfolio includes Colorado College's Honnen Ice Arena and the downtown Pikes Peak Center. This Friday, Aug. 24, Café 36 will host the annual Design Awards Gala to celebrate the architectural achievements of Colorado architects. See the full day's events here. Cart), 1860, cottonwood, pine, gesso, wood and leather. On view in the first-floor galleries in An Enduring Vision.